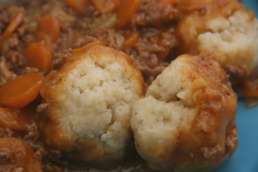 When I was growing up, family recipes mince and doughballs (otherwise know as dumplings or doughboys), were a staple of the Scottish diet. I may not always have agreed with the vegetable choice (who does as a child) to go with, but it still remains one of my fondest meals! Chop and sweat onions till transparent (use mixture of oil and butter to ensure no burning). Tip in beef mince (5%) and brown for several minutes – substitute with pork or turkey if required. Add appropriate stock cube or stock pot and get to a simmer. Add a couple of drops of Worcester Sauce – only a couple! Mix flour and suet together with a pinch of salt. Add drops of water until mixture is thick. Cover hands in flour and roll pieces of mixture into balls. 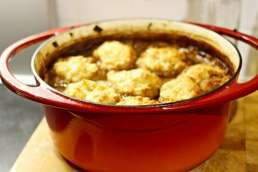 Place the dough balls on top of your mince (or any dish with a simmering gravy or stock) and place the lid on your pot for 15 minutes or until puffy. Leave these beauties alone, don’t keep checking them by taking the lid off your pot as this will make these flatten. Can be served with anything that has a stock or gravy like mince and tatties. It’s also a great recipes to get the kids involved in, as they love the making of dumplings. They don’t have to be neat, so it makes no difference if they are all the same size or not, get the kids involved!